UPDATE 4 March 2015: The Lipinski Amendment passed! It passed via voice vote, which appeared unanimous or very close to it. A big step forward, was gaining the support of Chairman Shuster for the amendment. Lipinski, Shuster, and Blumenauer spoke in favor on the House floor. The Amtrak funding bill now goes to the Senate. Now that the bicycle roll-on provision has passed the House, it is almost certain to survive in the final bill--support for issues like this is greater in the Senate than in the House. Easy roll-on of bicycles--as shown in this photo--could soon become standard on Amtrak in Missouri and across the U.S.
What the bill does, is require Amtrak to come back to Congress with a report for dealing with bicycle and wheelchair roll-on at Amtrak stations. The practical result will be a solidification of the movement towards providing for bicycle roll-on on all Amtrak trains across the country. We are very pleased that our positive experience in Missouri with bicycle roll-on on the Missouri River Runner Amtrak route has helped to shape the national conversation about the importance of bicycle roll-on access on Amtrak trains. Thanks to everyone who contacted your member of Congress on this issue! 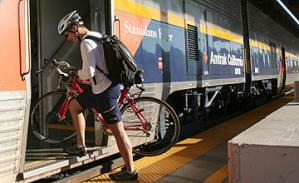 Please contact Congress to support roll-on bicycle access on Amtrak. Vote is planned for Wednesday, March 4th, 2015. Ask your representative to support the Lipinski Amendment. Spending 5 minutes email or calling your representative will make a difference on this amendment! Please support the Lipinski Amendment to H.R. 749, the PASSENGER RAIL REFORM AND INVESTMENT ACT OF 2015. The amendment will standardize train roll-on service for bicycles, wheelchairs and other devices used for transportation by people with disabilities. In Missouri, we have had roll-on bicycle service on the Missouri River Runner for over 15 years. It has been a very successful and popular service, with both Amtrak passengers and staff alike. We would like to see this roll-on service that has been so successful in Missouri taken nationwide. Standardizing roll-on service for people with disabilities and bicyclists will make the service ADA compliant and more accessible. The amendment will make Amtrak more accessible, increase ridership and give riders more transportation options once they get to their destination. Please support the Lipinski Amendment to standardize roll-on service. The vote on the Lipinsky Amendment is scheduled for Wed, March 4th. Votes are often delayed, so it may be helpful to contact your representative even if it is past that time. 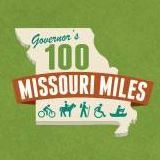 MoBikeFed has been part of a nationwide group working on this issue--Missouri's positive experience with allowing bicycles to roll-on Amtrak's Missouri River Runner has been one of the models we have been looking at in the effort to take bicycle roll-on capability to Amtrak trains nationwide. MoDOT is in the process of purchasing new train cars for the Missouri River Runner and other Amtrak routes in Missouri, that will greatly improve bicycle roll-on capability. The new Amtrak cars will hold many more bicycles, and they will also allow bicycles to be rolled on very easily--a big improvement over the current system which requires carrying your bicycle up several steep steps and around a sharp corner. Thanks for taking the time to contact your elected representative--it really does make a difference! « Previous story: MoDOT Commission Chair: Not My Bridge, Not My Road!